HELP! Our son was just given a box of 10,000 bees. We know nothing about bees. This bunch was split off from a hive that had grown too big, but it doesn't have a queen. We don't even know where queens come from. This is our son (I think?) with his new box of bees. Time to do some serious homework. I have this awful feeling that a Queen is needed ASAP. I think there is an introduction period and time for the eggs to develop. Turns out that isn't our son in the pic -- it's the friend who gave him the bees. It also turns out that we have a company in town that sells gentle queens, so we'll look into that on Tuesday. @countrynaturals wrote: Turns out that isn't our son in the pic -- it's the friend who gave him the bees. It also turns out that we have a company in town that sells gentle queens, so we'll look into that on Tuesday. A local company!? so lucky for him! These people are 4th generation beekeepers -- local legends in that arena. I guess we really are lucky. Maybe it's time to schedule a field trip to their establishment. UPDATE: The beekeeper dude said just leave them alone, so we did. They either had their own queen or made one. Now they are happy campers, nestled in between the river and the gardens. (This is our son's mil's property and she is an avid gardener.) Judy swears this is her best harvest already, from having these 10,000 servants working her land. Her fruit trees and veggie beds are producing in abundance. We have new renters across the street. I've noticed a lot of activity with pallets on a flat bed truck. But, last night I saw this and the mystery was solved! He is a professional bee keeper and sets the boxes on pallets out in the fields. Citrus, alfalfa, almonds, what ever is in season. 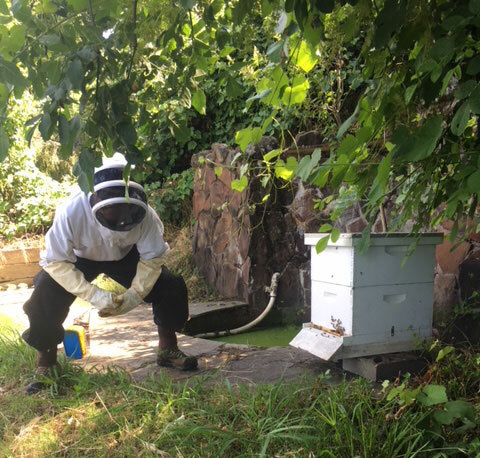 So now you are an "urban" bee keeper! Two of my kids have suggested I have a bee hive here on my 6,000 sq. ft. lot. I don't have a safe environment for them (urban = monthly pest control services for most home) and a reliable food source for them. Twenty years ago, the orange tree was a hazardous site to me with all the bees swarming the orange blossoms. Now I can literally count them. The bees produced their own queen. They were so happy they made lots of babies. Ed had to add more and more boxes. At last count, there were about 80,000. They disappeared overnight. When Ed talked to his expert, he found out the same thing happened to him and possibly all the bees in the area. 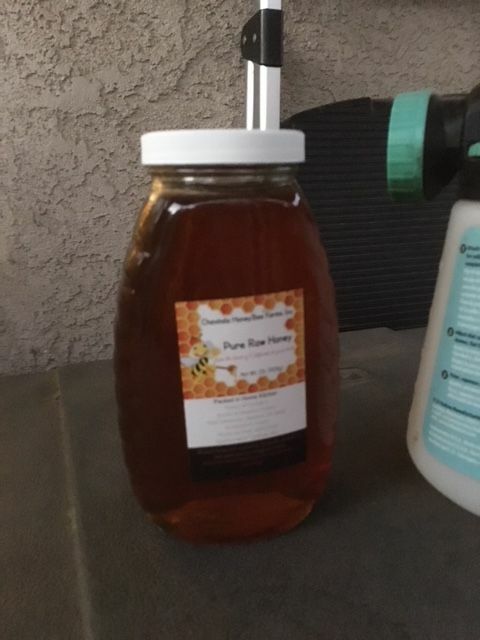 The theory is tha the Carr Fire poisoned the pollen, which poisoned the honey, which killed the queens, which caused the drones to abandon the hives. Ed didn't find any bodies, but his expert will come search later on. We're only a month away from needing pollinators for the fruit trees. This could be really bad news. I'll keep you posted. Oh, no!! I haven't read or heard anything about bees abandoning your area. I am so sorry for your loss. Another possibility is that with 1/3 million acres burned there isn't a local native food source for them. ?? Or the fire retardant that was used. ?? Major hive swarm to a better location. ?? @sanderson wrote: Oh, no!! I haven't read or heard anything about bees abandoning your area. I am so sorry for your loss. Another possibility is that with 1/3 million acres burned there isn't a local native food source for them. ?? Or the fire retardant that was used. ?? Major hive swarm to a better location. ?? I haven't heard anything, either. I will keep on this and post whatever I find out. We've seen a lot of hives today traveling to Oroville and even in Paradise, and north on 99 now. @sanderson wrote: We've seen a lot of hives today traveling to Oroville and even in Paradise, and north on 99 now. Maybe it was just a coincidence that a few around here moved on. I still haven't heard anything, which is probably good news. 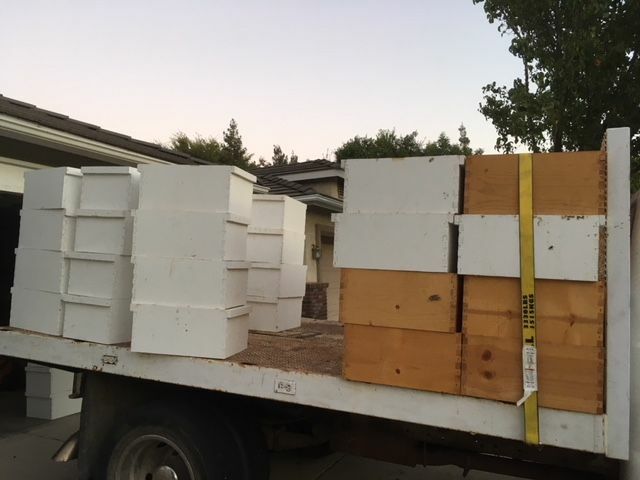 Commercial Montana hives are brought to California for the winter. If you see trailer loads of hives, some might have come from my neighbor's fields and pollinated a pepper or so for me. @Turan wrote: Commercial Montana hives are brought to California for the winter. If you see trailer loads of hives, some might have come from my neighbor's fields and pollinated a pepper or so for me. Bob saw a couple of honeybees on the bird feeder, today. Speaking of beekeepers...where the heck is CampRN?? ?